Last week I attended the Ohio Rug Camp at Punderson State Park. I was excited to be a student of Maggie Bonanomi! She has written 5 wonderful books of various stitchery techniques which includes a couple of rug hooking projects too. I am a huge fan of her style and thought how fortunate I was to have her teach at a rug camp close to me. It was also fun for me to be a student and to be able to hook all day and half of the night! 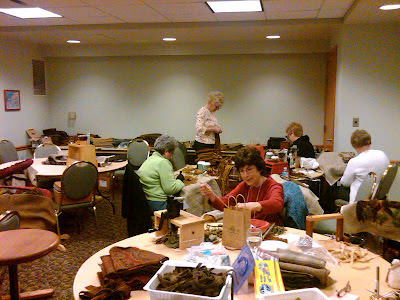 Here are a few classmates who were hooking after dinner. 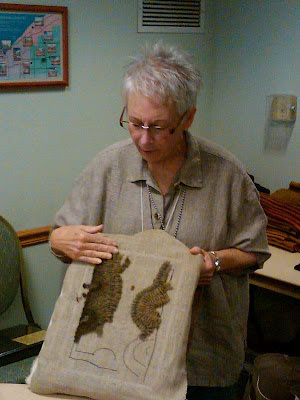 Here is Maggie, holding up one of the student's rugs and giving a little talk about the lamb tongue's border. 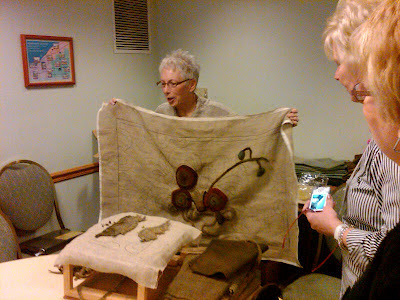 In her little demo, she was showing us about using soft browns and neutrals in the tongues. I love how she has stacked the browns from light to dark value. Yummy! It seems like I am always somewhere without my camera (!) 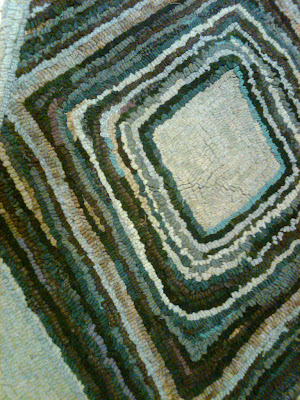 so I snapped this photo of one of her rugs with my smart phone. It doesn't come close to capturing the beauty of this antique look-alike. I swear that if I saw this rug in an antique store, I would have thought it was really old. Seriously. She talked about how we can hook wonky to make our rugs look old too. For those of you who know me (I hook w-a-y too even), I'd have to be alone in a dark room with a glass of wine... but, yes, I will definitely struggle practice hooking this way! I don't have any pictures of my rug in progress but I think it is coming along beautifully. Since I have so much going on right now, it may take me a while to complete, but I will post pictures when I do finally finish. Instead, I am posting a picture of a Maggie B. design that I helped color plan when I taught a workshop in St. Louis a few years ago. This was hooked by Deborah Holden. It looked like great fun, Kris!! I would love to take a class from her sometime for sure!! Love that green rug ~ wonky is hard ~ but you may have a shot at it in the dark room with the wine ~ that's funny!! Beautiful rugs & woolies! oh how I wish I could get Maggie here to teach ~ Hmmmm....maybe I can? I'm so happy I got to see you at Punderson! I look forward to seeing the progress on your rug! Lucky you taking a class with Maggie. 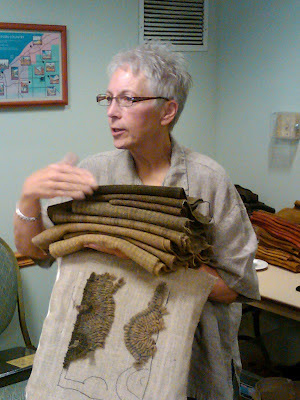 I love her designs and have hooked one of her rugs. Sorry, I had a typo. Here I go again. I too should drink wine when hooking. I tend to hook rather even. I love her designs, I love her colors too. What an inspiration! I love Maggie's work. I bought one of her books and I think I want to make all the patterns except for one! Are You A Copy Cat? Have you visited Spruce Ridge lately?